Our first port of call was Nelson, a beaut of a place. 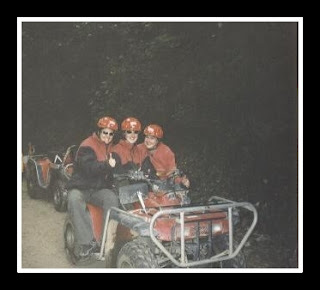 We went Quad Biking there. I honestly think I have found my calling, I feel the need for speed. We were bombing it through forests, up mountains, over lakes (OVER lakes, what am I, walking on water now). There were a few scary bits, when I had slowed to the back so I could get a clear stretch to myself (a major no no apparently) and I went out of control and nearly swan dived into a gorge! Otherwise, everything was going swimmingly, until we had to make a pit stop so the guides could lecture us on the flora and fauna… with adrenaline revving my motor, the stop felt...well... BOOORING, so the tree’s a few millennia old, big swing, write it all down and send it to National Geographic. To top it all off, one of the group considered himself a bit of a David Bellamy in the making and kept asking inane questions about the “Pwant Wife”. Despite that, it was a great day and we finished on a high. David Bellamy wishes BTCV Happy 50 years! from Doug BTCV on Vimeo.